To read these prints as contemporaries did, we need to follow the events as they perceived them. On Monday, November 3, 1828, Edinburgh awoke to the horrifying news that the most atrocious murders of the decade, or even of the century, had been committed in the West Port district of the Old Town. William Burke and William Hare, together with Helen M’Dougal and Margaret Hare, were accused of killing 16 people over the course of 12 months, in order to sell their cadavers as “subjects” for dissection. 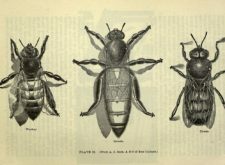 Their purchaser was Dr. Robert Knox, a well-regarded anatomical lecturer with a flourishing dissecting establishment in Surgeon’s Square. 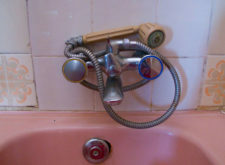 The murders were discovered when neighbors grew suspicious about the unexpected disappearance of a visitor, Margaret Campbell, and called for the police. Burkeing the Constitution of E-g—d!!!!! Burke, M’Dougal, and William and Margaret Hare were all arrested for Campbell’s murder. William and Margaret Hare turned witnesses for the prosecution in return for immunity, and Burke and M’Dougal were tried for murder on December 24, 1828. 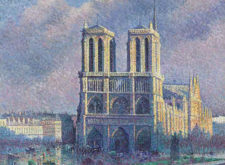 M’Dougal was acquitted with the distinctively Scots verdict, Not Proven, and Burke was convicted and sentenced to death. He was executed on January 28, 1829, with his body subsequently dissected and publicly exhibited. Burking, as actually practiced by its most famous practitioners, did not quite correspond to the popular image of it. 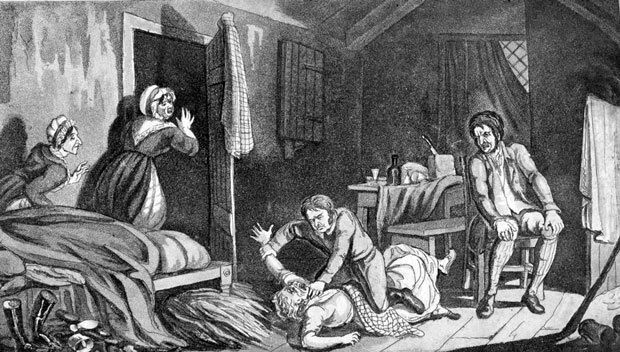 Burke and Hare, often assisted by McDougal and Margaret Hare, would encourage their intended victims to drink until they lay down and often, lost consciousness. At that point, as William Burke explained in a confession written shortly before his execution, Hare “clasped his hand on [the victim’s] nose and mouth,” while Burke “laid himself across the body” to prevent the diaphragm and ribcage from expanding. The result was an almost undetectable form of homicide. If the victim were small or frail, it could be carried out by a single practitioner, and Hare took advantage of that fact when he gave evidence as prosecution witness, insisting that Burke had murdered Margaret Campbell all on his own while he, Hare, innocently sat nearby. The image below, by the artist Robert Seymour, later to be Charles Dickens’ first illustrator, neatly illustrates Hare’s testimony and his cross-examination at Burke’s trial. Burke’s defense attorney, Henry Cockburn, did all he could to impugn Hare’s testimony. “And did you sit in the chair?” Cockburn asked, while Burke was murdering Margaret Campbell. 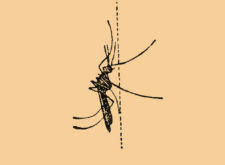 “And did you sit ten minutes on that chair without stirring one hand to help her?” “You did not cover your head?” “You stood and saw it with your own eyes?” “You did not call murder or police?” To all of these, Hare answered, simply, “Yes.” Small wonder that Seymour made Hare, looking on from a chair, as prominent in the picture as Burke committing the actual murder. Seymour included the two women, Helen McDougal and Margaret Hare, in the image even though it was clear from the trial record that neither had been present when Campbell was killed. 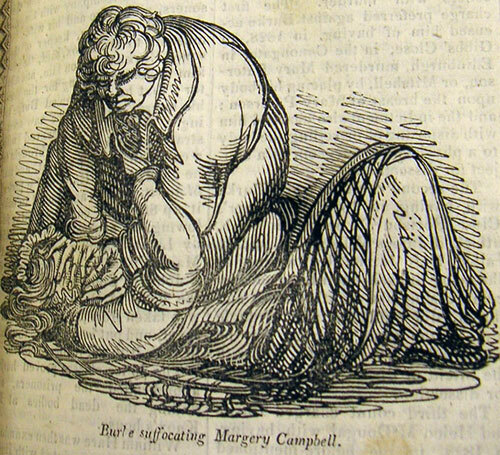 And he included the very striking image of Campbell struggling, with outstretched arm, in what was to become the classic image of a victim in the act of being burked, despite the historical Margaret Campbell being unconscious from drink at the time of her death. Much of the public outrage against Burke and Hare was directed with equal vehemence against Robert Knox, who was widely viewed as the instigator of the murders. 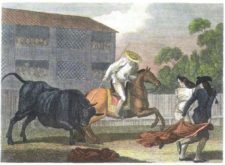 One commentator on Burke’s confession noted “the facility with which Burke and Hare got a purchaser “ for the bodies, “and the desire to see them again when they had any other body to dispose of, must have been great inducements to such miscreants to commence their career of murder.” Knox was caricatured with images and with every possible play on words associated with his name. 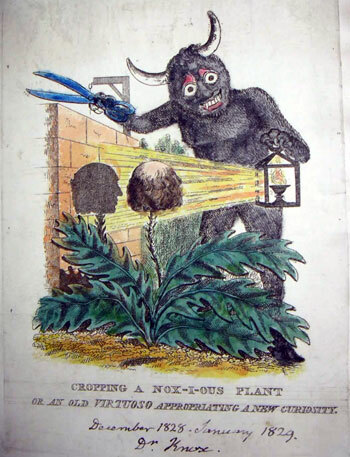 In one of these images, a crudely-drawn devil is cropping a very carefully-rendered likeness of Knox’s head and profile, with the title “Cropping a Nox-i-ous Plant”. Whether William Heath was familiar with Seymour’s illustration is hard to say, but he clearly drew on Burke and Hare imagery in creating his “Burking Poor Old Mrs. Constitution” print in April 1829, opposing the Catholic Relief Act. Sir Robert Peel is depicted in Hare’s role, clasping his hand on the victim’s nose and mouth, while the Duke of Wellington lays himself across her body. 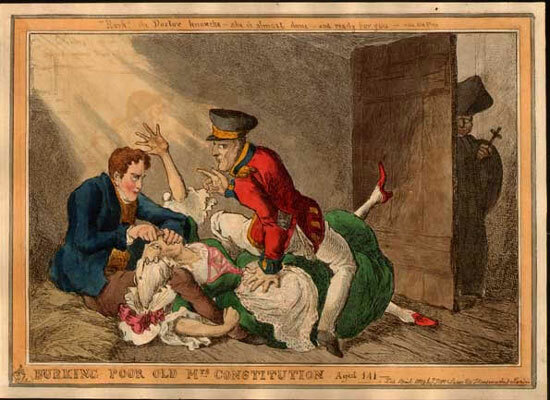 Mrs. Constitution, like Margaret Campbell, has an outstretched arm and leg, though she is rather more elegantly dressed than the actual victim. 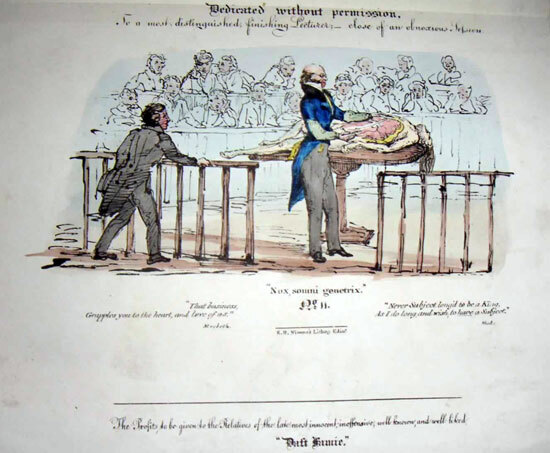 A Catholic prelate waits outside for the cadaver; and in case any readers did not get the reference, the caption at the top reads “Hark: The Doctor knoxcks – -she is almost done and ready for you.” The anonymous print, “Burkeing the Constitution of E-g—d!!!! !” uses similar imagery though it is less skillfully drawn. 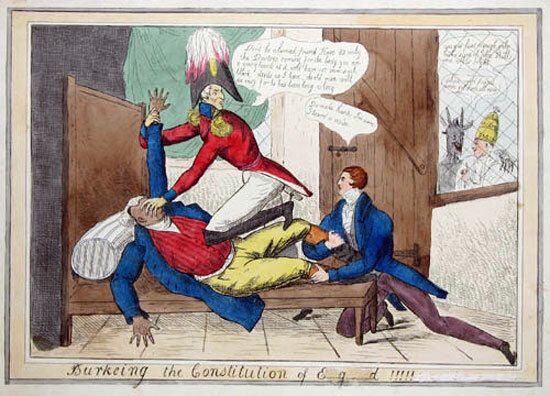 Here the constitution is a man, and he is being murdered in a wooden bed, complete with pillow, rather than on straw. This time the Duke of Wellington, as Burke, covers his victim’s face while holding his outstretched arm, while Hare keeps hold of his legs. A bishop and a devil wait outside the door. “Do make haste. I’m sure I heard a noise<” says Sir Robert. 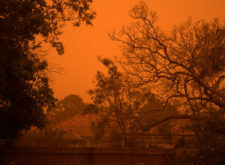 “Don’t be alarmed friend Hare,” says the Duke, “its only the Doctors coming for the body you are a young hand at it, and have not seen such black deeds as I have, the old man will die easy for he has been long ailing.” “I think old friend we’ve got them all now,” says the devil, and “yes yes fast enough only make sure of John Bull and all is right,” replies the bishop. Tarring Peel with the Burke and Hare brush was especially unfair, as he had been horrified at the disclosures of so many murders, “these proceedings for which language has no epithets,” as he called them. He pushed for an investigation into the behavior of Knox and his associates, because the evidence “implicated, in a most obvious degree – morally certainly if not legally – other persons besides those who have been placed upon their trial.” He found Knox’s actions in accepting cadaver after cadaver highly suspicious: “Did it not occur to Dr. Knox,” he wrote to the Lord Advocate of Scotland, “on actual anatomy of the bodies – that the bodies were recently dead – that Burke’s account to him of their being received from the country – or as to the period of their death – were untrue?” Had he not been “struck by the singular similarity there must have been to this mode by which life became extinct in those bodies which Burke brought him?” “There is ground for the most painful suspicions,” he concluded, and he strongly supported what became the Anatomy Act of 1832, regulating the process by which medical schools obtained cadavers. Lisa Rosner is Professor of History at Stockton College. She is the author of The Anatomy Murders: Being the True and Spectacular History of Edinburgh’s Notorious Burke and Hare and of the Man of Science Who Abetted Them in the Commission of Their Most Heinous Crimes .